Abortion advocates routinely (and falsely) claim that abortion needs to be legal to prevent women from being butchered in back-alley abortions. But why does the abortion industry fight tooth and nail against regulations that would enable women to get medical treatment if they are injured during an abortion or if a medication abortion fails and the woman encounters an emergency situation? In Missouri, a proposed law would mandate that any facility that commits medication abortions also have a written agreement with an OBGYN who has admitting privileges at a local hospital. This OBGYN would be on call to save a woman’s life if she is injured after a botched abortion. This law should be an easy pass if Planned Parenthood cares about women’s long-term health, as it claims to. Yet these kinds of regulations come under fire, time and time again — in every state they are proposed in. In Missouri, Planned Parenthood is specifically complaining about the cost of hiring an actual doctor to be on call in the case of an emergency after a botched abortion. The St. Louis, Missouri, Planned Parenthood is notorious for sending women to the hospital after botched abortions. An ambulance parked outside the St. Louis Planned Parenthood. The proposed law would require abortion facilities to have a plan to deal with complications that arise, specifically in emergency situations. If an abortion facility fails to have a “complications plan” that is approved by a state department, it will not be allowed to commit medication abortions. 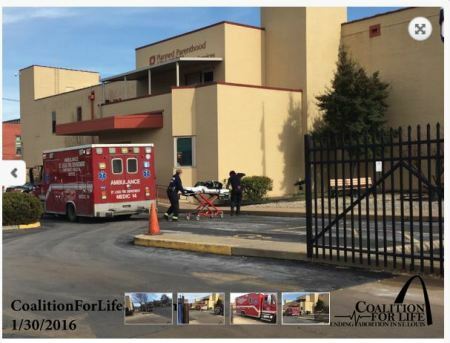 One patient transport to a hospital every six weeks on average from just the St. Louis Planned Parenthood does not sound like “patient safety” but clearly, Planned Parenthood would prefer that emergency room physicians handle women’s abortion complications alone. Leaving a woman who has undergone a botched abortion at the mercy of an ER doctor who may not be an OBGYN and who does not know the details of what happened to her puts women at greater risk. In truth, the new regulations would not create greater financial burdens, proving that Planned Parenthood is lying to the public, as per usual. “[T]he state analysis notes that ‘the abortion facilities currently licensed in Missouri employ more than one OBGYN, so no fiscal impact is assumed for those facilities’,” Schmitt notes (emphasis added). “That Planned Parenthood branch, which operates the Springfield, Joplin and St. Louis clinics, has an average annual revenue and expenses of about $3.2 million, according to its most recent public IRS filings,” Schmitt explains. “Staffing a full-time on-call OB/GYN at each clinic that provides abortions would cost $547,500 — about 17 percent of the organization’s budget.” That is, if those facilities didn’t already have staff members to fill the bill — but they do. So why is Planned Parenthood opposed to following laws while committing medication abortions? One is left to wonder how requiring a doctor to be on call for a facility that constantly botches abortions “punishes” the women who go to Planned Parenthood. Planned Parenthood’s own history shows that its facilities are not safe for women. Multiple women — Cree Irwin-Sheppard, Tonya Reaves and others — have been killed at Planned Parenthood. Others — Ayanna Byer, Roberta Clark — were injured in botched abortions. There are countless others. Complications from a medication abortion include nausea, vomiting, diarrhea, abdominal pain, and headache. Additionally, some women are hospitalized due to extremely heavy bleeding; others undergo a surgical abortion after the medical abortion or must have another surgical procedure to fix the damage caused. Some women have died, most often from infection or undiagnosed ectopic pregnancies. The long-term effects of the pills used in medication abortion are not yet known. The majority of the medical establishment supports admitting privileges. Why should abortionists be exempt from these requirements? If abortion facilities like Planned Parenthood truly care about the women they claim to serve, they should not be complaining about being required to provide these same women access to life-saving medical care after a botched abortion. Editor’s Note: If you or someone you know has taken a pill for medication abortion (also known as RU486, medical abortion, or chemical abortion), abortion reversal may be possible — even if Planned Parenthood claims the only option is a surgical abortion. You can contact the 24-hour nurse-staffed hotline at Abortion Pill Reversal or by calling 1-877-558-0333 to hear about your options or a doctor near you who may be able to assist in reversing the abortion.